Welcome to Solera, where you're not just buying a house, but a lifestyle. Gated golf course, 55+ community offering multiple pools, work out facility, tennis, pickle ball, bocce ball and so much more. Original owner has made this the best Cholla floor plan in the community. Beautiful 16'' tile on diagonal in entry, hall, kitchen and dining area. Tri West wood laminate Kauai Collection/Native Tigerwood with premium EVA underlayment. Upgraded Cherry cabinet in kitchen with pullout shelves, and matching cabinets in bathrooms. 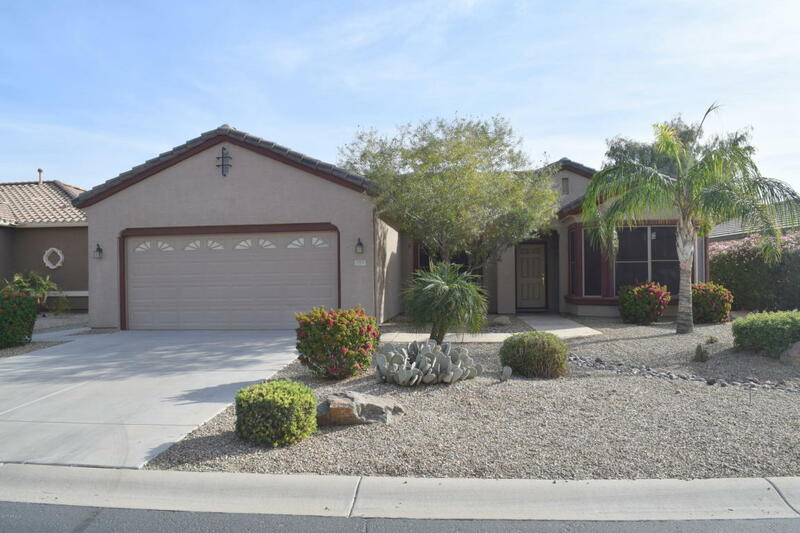 Solid thick granite slab counter tops in kitchen and upgraded stainless steel appliances. Custom wood plantation shutters throughout and Concorde ceiling fans. Golf course views from front and mountain view in rear. Extended covered patio with artistic concrete design.